I have stated publicly in the past that I wish and hope a better MMO will come along and steal WoW players, myself included. I have eagerly tried as many MMOs as I could (Age of Conan, Guild Wars, Tabula Rasa, Matrix Online, DDO, LOTRO, Rift, City of Heroes, Warhammer Online, etc.) to hopefully find a game that I could enjoy in equal or greater amounts. It has not happened…yet. Star Wars: The Old Republic was only the latest game in which I focused this hope only to see it fail to pull me away from WoW. I got on board with SW:TOR, and I got in early. The first thing I noticed about the game was that the production values were super high. Maybe too high? The first 10 levels alone were filled with great voice acting and story lines that seemed almost unnecessary, yet very well done. For those first 10 levels, I felt like I was playing a fantastic single player game (SW:KOTOR). I usually call it Trial of the Isle, thinking back to the first levels of Everquest II which drops the player on an island of early levels before you were able to join the likes of the real world. Many MMOs do this in some sense, and it is because of this that it is usually hard to get a feel for what the rest of the game is going to be like. My problem with SW:TOR is that the early zone feeling never went away. Many of the world zones were one way in, one way out. Mountains or structures blocked you in and this takes away much of the exploration aspect of the game. In short, there really is none. Paths are on rails somewhat similar to Guild Wars. I cannot speak to later zones, but this identifies a major flaw in the game. The likes of early zones like Tython and Coruscant turned me off so much that I eventually quit. I can see how a zone like Tython might follow an "Isle"-like flow just to get a player going from level 1 to level 10. But as I arrived at Coruscant, not much changed in that sense. Sure, you get your own ship and can explore outer space, but it's not the same. I still think a good MMO is one you could literally get lost in at some point, of course, ignoring all of today's map technology intelligently infused in almost every game. To be honest, I did get lost in SW:TOR but that's not because the world was vast and enchanting, but because the map system was lacking and the amount of instancing made certain areas confusing to get to and confusing in trying to understand where zones fit in the grand scheme of SW:TOR's world. 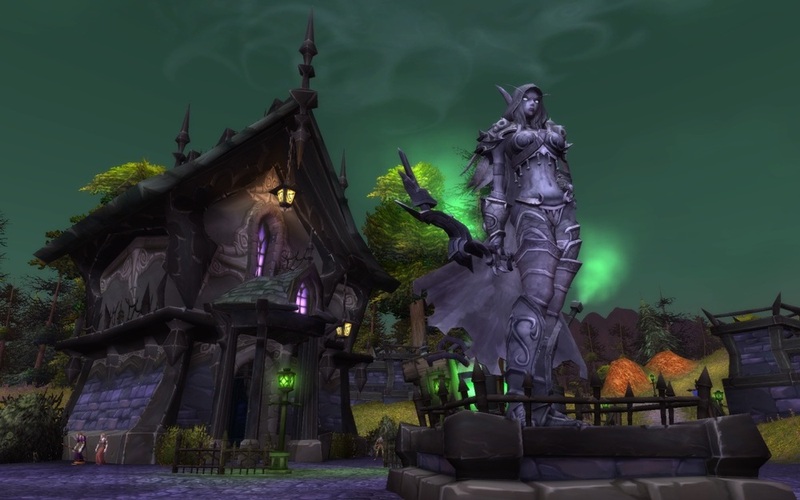 In contrast, as an Undead, the Deathknell zone is WoW's version of the "Isle". You are greeted with a generous open layout, even though you are "locked in" to a small zone considering the rest of the game. Once you reach level 7 or 8, you move onto Brill. Brill is a beautiful zone (even after the Cataclysm) complete with graveyards and creepy forest land that sets the tone for the surrounding zones as well. And it's open. Roam through the trees or swim to the bottom of Brightwater Lake. Explore to your heart's content. Brill is neighbors with The Undercity a major capital city and hub, the road to Silverpine Forest, and the roads that lead to the Scarlet Monastery and the Eastern and Western Plaguelands. The beauty is that you can go wherever and whenever you so choose. This means that players are escorted into in the real world from the get go. This is the kind of "charm" other games lack. Of course, beginning zones like those of the Blood Elf and Draenei are still unique exceptions, but while instanced, those zones still offer the same exploratory experience as any other zones attached to the world. Not knowing very much about the entire world within WoW, I took a break in leveling at a mere level 17. I noticed blimps that you could get on and they appeared to bring you "somewhere". With a certain innocence and lust for exploration, I unknowingly, but excitedly boarded the giant airship to Grom'gol, Stranglethorn. When I arrived, I was in awe of the jungle-like setting and base that the Horde set up here. With not a care in the world, I left Grom'gol basecamp hoping to find…something, but really, I just wanted to look around. Within the first few minutes of leaving the base on the north side I saw creatures that resembled dinosaurs. I thought: "Oh wow this is cool!". Seconds later these, what I now know as raptors, aggroed me and I was dead before I could see the skulls next to their nameplate. But I wasn't angry. I was happy to have the option of freely and innocently exploring that zone and finding out on my own, that it came with the risk of dying to much higher level creatures. Looking back now, I cannot remember having a similar experience in any other game, where I felt this charmed by exploration. The only other time it happened was when I mounted up in WoW: The Burning Crusade right after its midnight launch, in Hellfire Peninsula and rode all the way to Nagrand just to see what awaited me in 5 more levels. It was a great exploratory experience and of course I was one-shotted by a higher level mob and of course, I didn't mind. To be fair, the lack of “charm of exploration” was not the only reason I left SW:TOR. But it was the first reason. An MMO has to feel “right” from the beginning and throughout your entire experience, and then some, if the game company expects you to thrive and be happy in its end game. SW:TOR did some things right. It had a decent sense of character progression (your character feels progressively stronger as levels increase). There were numerous choices for gear and items on your way up to the end game. The story lines were very well thought out and produced. In the end, after 4 weeks of play, the game lost me and I cite the world as the first tipping point. WoW is still the giant shadow hovering over this genre because it has set the bar so high on so many levels that we expect new MMOs to have learned all of the mistakes. We expect MMOs to build better systems and ideas than WoW right out of the gate. We are also fine with a new game literally stealing what it needs to from WoW to gain familiarity with the players. 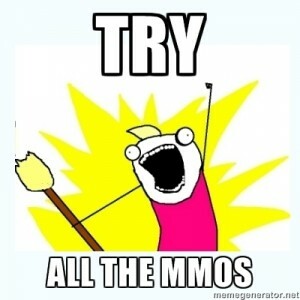 We unfairly expect EVERY new MMO to accomplish this. But was it such a tall order to expect SW:TOR to accomplish, at least some of these things? What, with its huge budget ($200 million), huge publisher (EA), super successful developer (BioWare), and one of the most storied franchises in the world (Star Wars). It helps us grudgingly conclude that what we suspected for quite some time, may be true. The only company that can pull us away from World of Warcraft may quite literally be Blizzard themselves.